Vitamin A is required for growth and reproduction of the skin, and differentiation of epithelial tissue. This is important because your skin ages over time and the results are wrinkles, rough texture, discolorations, and thinning. Retinyl Palmitate is an essential fat-soluble vitamin that is used to combat these negative effects and promote healthy skin. Vitamin A visibly improves the appearance of mature, sun damaged, and dry skin while it hydrates, and softens to help re-create a smooth, supple texture and tone. It’s also an excellent protector against negative environmental elements. Vitamin A in lotions and creams is a necessity for overall healthy skin and a great complexion. While many benefits can be realized from dietary intake, topical A application is known to stimulate the growth of the base layer of skin cells, in that it helps the cells differentiate normally and provides its structural integrity. Boosts collagen production giving you a firmer skin. Powerful anti-oxidant reduce wrinkles and fine lines. Fade Sun / age spots. Works as a mild exfoliant removing tired dead skin giving you a clearer, healthier complexion. 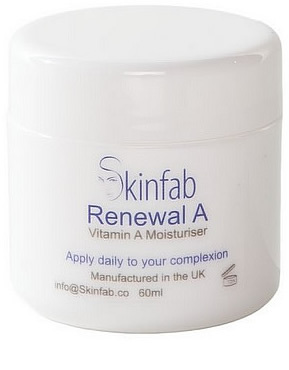 Our Vitamin A is supplied in a unique delivery system which ensures that more of the Vitamin A penetrates the epidermis where it can be far more effective. Liposphere carrier systems have been developed to transport cosmetic actives into the skin. These systems ease the transport of actives through the skin barrier and, furthermore, deliver these actives in a sufficient concentration to the site of interaction. Lipospheres create a very densely packed membrane of small sized, stable particles containing Retinyl Palmitate molecules. The lipospheres deliver the highest amount of actives deep into the layers of the skin and promotes an efficacy that is 100 times that of non-encapsulated actives!!. If you have used Vitamin A creams before then you will be amazed at how much more effective this new technology is. Ingredients: Vitamin A Lipospheres, Subliskin, Hyaluronic Acid, Water, Rosewater, Glycerine, Almond Oil, Apricot Kernel Oil, Cherry Kernel Oil, Shea Butter, Emulsifying Wax, Cetyl Esters, Isodecyl Neopentanoate, Alkyl Benzoate, Gluconolactone, Sodium Benzoate.